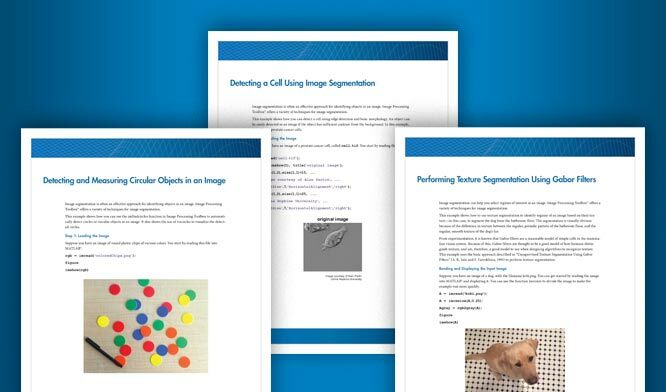 Image Processing Toolbox™ provides a comprehensive set of reference-standard algorithms and workflow apps for image processing, analysis, visualization, and algorithm development. You can perform image segmentation, image enhancement, noise reduction, geometric transformations, and image registration using deep learning and traditional image processing techniques. The toolbox supports processing of 2D, 3D, and arbitrarily large images. Image Processing Toolbox apps let you automate common image processing workflows. You can interactively segment image data, compare image registration techniques, and batch-process large datasets. Visualization functions and apps let you explore images, 3D volumes, and videos; adjust contrast; create histograms; and manipulate regions of interest (ROIs).